Less than 30 days later, the owner, through her attorney, wrote back: “her failure to seek approval was simply an oversight. She does not want to be in violation of any rules. She will apply for approval as soon as she has the application. Please send me the necessary forms.” The manager responded that the Board wants the tenant out and refused to provide the application. The Association filed for non-binding Arbitration as required by the Condominium Act and lost. The Arbitrator ruled that nothing in the Declaration allowed the Association to evict the tenant without giving her an application and requesting that it be submitted. The Declaration even stated that if an owner leases a unit without approval, the Board, after learning of the fact, “may approve or disapprove” the lease. The Arbitrator ruled that the Board could not act arbitrarily and had to afford the owner an opportunity to submit an application, which she had attempted to do. The Association wasn’t satisfied. It filed a Complaint in court, seeking injunctive relief to require the owner to evict her tenant. When the trial judge learned that the Association refused her request for an application, he ordered the Association to furnish a tenant application form and consider it solely on its merits. It was promptly submitted after being received by the owner and quickly approved by the Board. Soon thereafter, the judge threw out the case and awarded the unit owner her attorney’s fees. The unit owner was also entitled to recover her attorney fees incurred during the Arbitration proceedings. The Association lost for several legal reasons, primarily because of the language in this particular Declaration. Since every Declaration differs, you must read it carefully in every instance. However, it is clear that the Association also lost because it was petty and malicious. Judges don’t want their time taken up with “cases” such as this! There was no reason that the manager could not have sent the owner an application when it was requested, and considered it when received, even though the tenant had moved in. The Association admitted that the tenant has caused no problems and was not in violation of any other rule. Prospective tenants don’t always have the luxury of waiting 20-30 days for screening committees to do a background check. Consider this: if the tenant moved out as the manager demanded, the owner would then have had an absolute right to obtain and submit an application. When approved, the tenant could move back in. There was no reason to force a tenant to go through that hardship, especially considering that in all likelihood, if the tenant was forced out, he will rent elsewhere. This made the Association appear malicious to the plight of the owner and tenant. Had the Association exercised a little common sense and reason, two years of legal proceedings and substantial legal fees would have been avoided. The lesson here is – before running to Court, exercise a little reason. One last note: In the 1997 amendments to the Condominium Act, the Legislature removed “eviction or other removal of a tenant from a unit” from the types of disputes that must be arbitrated. 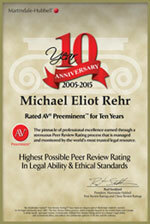 Michael E. Rehr, Esq. represented the unit owner in the foregoing case.